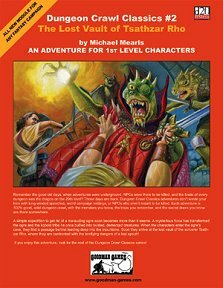 This module presents a three-level dungeon delve that ought to take characters from 1st to 3rd level, provided that they survive. They'll need wits, courage, and luck to triumph. There's plenty of combat but also situations that call on the party to plan, be ingenious and apply tactics rather than just rush in waving a sword and yelling! It all begins somewhere in your campaign world, where the inhabitants of a fairly isolated village ask for help in dealing with an ogre. He's lived in a nearby cave for ages, but until now has contented himself with robbing the odd passing merchant and bullying the local kobolds. Now he's turned into a psychoic madman and needs to be stopped. Parties which agree to help will be directed to the cave, the inhabitants of which have until recently been quite peaceful. Now they are aggressive and causing more and more of a problem. There are clear maps, and each room's notes are divided into three sections. Firstly, there's a description that can be used to explain what the party sees when it enters. This includes things that are there but need to be searched for as well as what's obvious as soon as you stick your head round the door. Next is a section on inhabitants, covering monsters and NPCs, including their EL and what they are carrying. Finally there's a section on 'development' which discusses the likely actions, tactics, etc. of whoever is there. All the stat blocks, however, are at the end of the module rather than in the room description where they are needed, although there is a note recommending that you photocopy them (or if you're a PDF-user, print them out) so as to have them available for easy reference whilst running the module. There's a lot going on, but it all makes sense why each creature is where it has been placed, even if this is intended as a classic 'dungeon delve' where you expect to have to fight everything that you meet there. There's not much of a conclusion: it's assumed that the party is successful in foiling the Outer Ones plot and just mentions that they may be out for vengeance for having been thwarted... not very much to go on. It does make for an entertaining delve for those who relish a few sessions prowling subterranean vaults killing and looting as they go, but in some ways the backstory is quite redundant: just get in there and fight! Return to The Lost Vault of Tsathzar Rho page.